Members and guests have fun at the Clubhouse – Don’t disrupt private parties. Fish to your heart’s content – Practice catch and release. 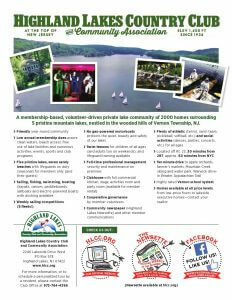 Keep Highland Lakes Clean – Pick up on your walks and hikes. Keep parks and freeways clean. Practice Carry-In/Carry-Out. Enjoy our Parks – Keep dogs on leash please and bag up waste – it’s the law. Sailing/Boating is terrific – Please don’t sit on someone else’s docked boats! Tying up to sailing buoys prohibited. Enjoy our Beaches – Please don’t leave children unattended. Slow Down and Enjoy the View – 15 mph recommended/New Jersey speed limit is 25. Wear you Club badge with Pride – You’re not ‘in’ without it. Be thoughtful and considerate of neighbors – Turn down loud stereos – don’t make unnecessary noise. New Jersey prohibits fireworks. 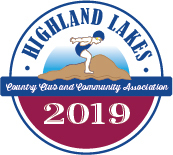 Keep Highland Lakes a safe community – Call Security – emergencies dial 9-1-1. Get involved and volunteer- Everyone else can’t do it all. 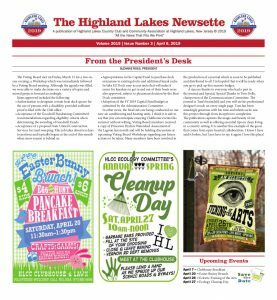 Pick up or read the Highland Lakes Newsette, subscribe to email updates, and click www.hlcc.org – They are your information hotlines. Great yard sale –Take down your signs after sale. Enjoy the wildlife – Don’t feed any of them. Contact your Section Trustee with questions – Be informed, come to a Voting Board meeting.